After attending Matt “Lunartik” Jones‘s Plastik Surgery Workshop at 2017’s Pictoplasma Academy, the Swiss artist known as Haï-Dee swore off his then-prominent sculptural medium, his unique Kill Bob piece being the last made out of the colorful Fimo polymer clay. Having learned how to create resin art toys from start-to-finish during the two-day Masterclass, Haï-Dee ended the course with his own buck-toothed and bark-textured Woodo form in hand. Seeking to continue using this medium, Haï-Dee developed the M. Shun resin figure inspired by Roger Hargreaves‘ Mr. Men series, the piece used as part of a guest gift set for his second child’s baptism. Perhaps more comfortable with resin after accomplishing these pieces, Haï-Dee embarked on creating his first resin art toy for public consumption, his Nessya work debuting at Martian Toys‘ NESS is MORE exhibition. Described by the artist as a Naiad, or female spirit, who presides over Loch Ness, her connection to the cryptozoological creature purported to roam those depths strengthed by their shared name: Nessya being a variation in Greek of Nessie, the affectionate nickname for the Loch Ness Monster. Straying from a traditional interpretation, Haï-Dee’s creation is rather a femme animale, or animal-woman, stemming from the same mythological conventions as the mermaid or the harpy. Potentially seen as a fetishized image of monstrous womanhood, the artist specifically chose to desexualize his Nessya sculpture, removing every hint of femininity from the form save for its striking, proud, and beauteous alternagirl head. And it is perhaps natural that the viewer’s gaze is drawn to this sole shred of humanity apparent on his Haï-Dee’s work, this aspect bearing an uncanny resemblance to the blue-haired protagonist from the video game Gris. But it seems less likely that Nessya is Haï-Dee’s interpretation of the girl from Gris rather than his rendition of the shadowy monster which obstructs her heroic quest to bring color back into the world, especially since the creature’s fluid form morphs into a grotesque mirror of the girl’s appearance for their ultimate encounter. And as its pinhole-tipped tendrils whip forth, the beast devouring the girl with the likeness of her own mouth, one major difference between the heroine’s nemesis and Haï-Dee’s creation is the coloring; the game depicting it as a black-and-white monstrosity, devoid of the colorful rebirth that the story revolves around, while the artist imbues his versions with blue- and red-hued tones. Thus Nessya seems like neither character — the ‘good girl’ nor the ‘bad girl’ — but rather a merging of the two into the ‘real girl’, her ugly and beautiful parts proudly exposed. 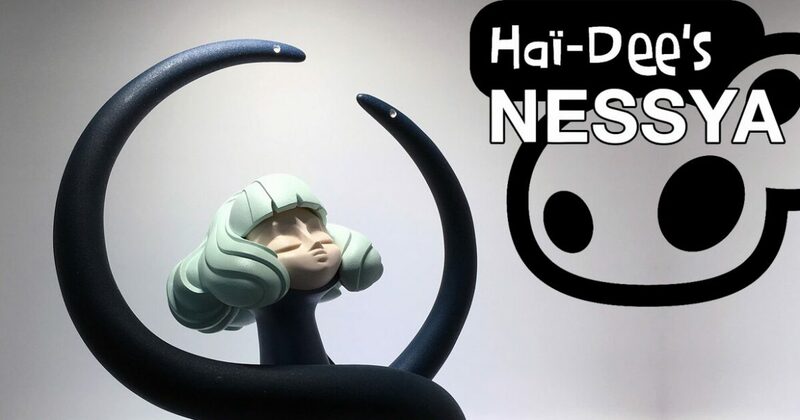 Haï-Dee’s Nessya sculptures were displayed at the NESS is MORE exhibition, which took place on March 30th and 31st, 2019 at the Martian Toys‘ section of ToyCon UK (5 Old Ford Rd, London E2 9PJ, UK). View the gallery’s dedicated page for the NESS is MORE exhibition.